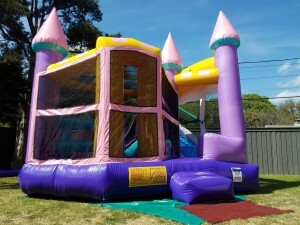 This is our Dazzling 5-in-1 combo inflatable. It sparkles when exposed to the Sun! Perfect for any young girls party! Includes basketball hoop, pop-up obstacles and a slide (dry or wet). We will need 22×22 feet for safe setup on grass or concrete. It has a sunscreen roof to protect kids playing on it from the sun and to keep the jumping surface cool to the touch. 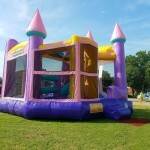 With an inflatable step attached to make it easier to enter the bounce house and slide area. It is perfect for children from 2 to 12 years old with a total capacity of 1,000 pounds (on a flat surface). Jump City team will deliver and setup. We will need a gate of at least of 42 inches if setup is desired in a fenced in area. 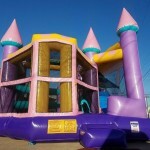 Made right here in the USA by the top manufacturer of inflatable bounce houses and water slides. This unit is Lead FREE. 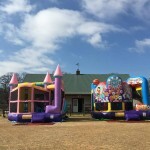 Rent This Combination Bounce House and Slide!